Astronomers have found the first aurora to be seen outside our solar system. The light show was spotted around a brown dwarf, and field experts say that it shines a million times brighter than anything we can witness on planet Earth. Auroras are described as radiant displays of colorful light, seen in the sky. We have two on our planet – the northern lights and the southern lights – however the natural phenomenon has also been observed on other neighboring planets with magnetic fields. They are formed when currents from a planet’s magnetosphere force electrons to come down into the atmosphere where they collide with the molecules found within and result in the beautiful light shows that we all know and love. For their study, the research team looked at the space object known as “LSR J1835+3259”. It’s a Jupiter-sized world located 18.5 light years away from the Earth. Its exact nature remains a mystery as astronomers say that it’s more massive than planet Jupiter by several dozen times, which means that the object is too heavy to be labeled a planet, but also too light to be labeled a star. Currently, the scientific community has agreed to call it a brown dwarf, a misfit object also referred to as a failed planet. In 2001, a team of astronomers led by Gregg Hallinan from the California Institute of Technology (Pasadena) found that brown dwarfs are capable of generating radio waves. The discovery was a surprising one as this type of behavior is typically exhibited by very active stars. And later, in 2008, the same team found that LSR J1835+3259 not only emitted radio waves, but emitted them in pulses. 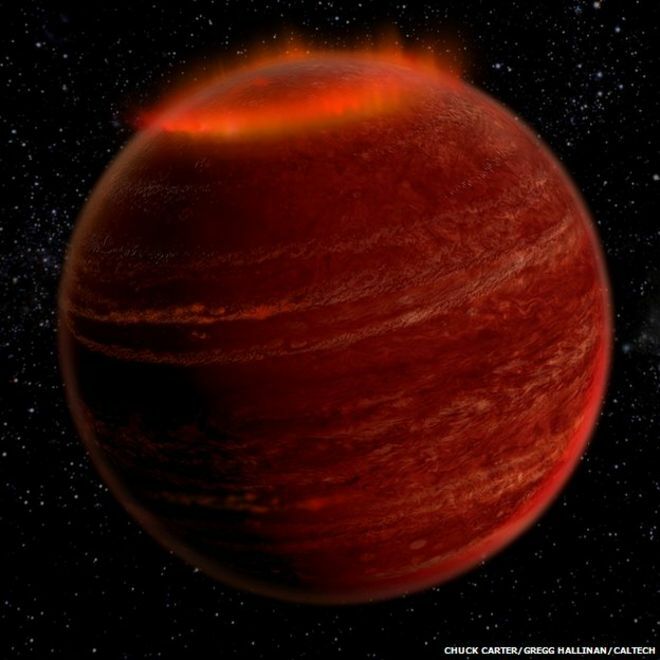 This sparked the astronomers’ curiosity as they “knew that radio pulses from planets in our own solar system were caused by aurorae, so we thought maybe brown dwarfs had aurorae too”. The next step was for the field experts to scan both radio and visible wavelengths of light in order to detect the brown dwarf’s aurora. Hallinan gave a statement saying that if people were somehow able to stand on LSR J1835+3259 and survive its intense gravity and radical temperatures, they’d witness “a beautiful bright-red aurora”. He also went on to explain that the color an aurora has depends on what the atmosphere of the planet is made out of. For instance, the Earth’s auroras are blue, green and red because of the oxygen and nitrogen in the atmosphere. But in the case of gas giants and brown dwarfs they’re red because of the high levels of hydrogen in the atmosphere.